This morning you will be collected by a guide from Far and Wild Safaris, from the O R Tambo International Airport or from your overnight accommodation in Johannesburg and we then travel through the Highveld industrial, mining and agricultural areas. Our guide will make this section interesting, adding value with his interpretation of the local history and sights. The scenery is pretty flat but changes as we approach the Drakensberg Escarpment, where we drop down to the Lowveld through scenic passes. This Drakensberg Escarpment area has scenic vistas over the Lowveld of the Kruger National Park. The fresh mountain scenery and panoramic views over the Klein Drakensberg escarpment are quite spectacular and give the area its name of 'Panorama Route'. The geology and climate of this high rainfall plateau results in masses of waterfalls. Some are hidden deep within some of the largest man-made forestry plantations in the world, with row upon row of pine and eucalyptus trees. We will visit the Panorama Escarpment and some of the view-sites such as God's Window, Blyde River Canyon, Berlin and Lisbon waterfalls, etc. and overnight at Hannah Lodge (or similar). Hannah is a reflection of Africa in its entire natural splendour, a captivating tapestry of African sounds, smells and colours. The rising sun showers the valley with shades of pink, red and orange. 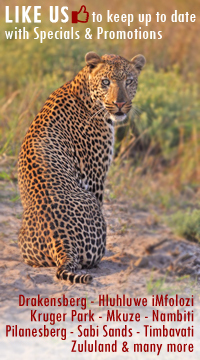 Game viewing is carried out during the morning and evening and has been refined to an art by highly experienced rangers. Traversing through the reserve, the wildlife is staggering in its diversity. The game drives take between 3 - 4 hours, with a coffee stop in the morning and a sundowner's stop at a vantage point overlooking one of the many breathtaking vistas at sunset. This morning after breakfast we make our way to the nearby Mkuze Game Reserve. A place of great beauty and high contrasts, Mkhuze is renowned as a mecca for bird lovers, with more than 420 bird species on record. The reserve has an astonishing diversity of natural habitats, from the eastern slopes of the Lebombo Mountains along its eastern boundary, to broad stretches of acacia savannah, swamps and a variety of woodlands and riverine forest. Mkhuze Game Reserve constitutes the north-western spur of the Greater St Lucia Wetland Park, a recently declared World Heritage Site. Animals to be found in the reserve include black and white rhinoceros, elephant, giraffe, leopard, buffalo, nyala, blue wildebeest, warthog, impala, kudu and other smaller antelope. Rare species occurring are cheetah, hyena and suni. Visitors may enjoy excellent animal and bird sightings from the hides in the reserve, especially during the dry months. We then make our way to the Hilltop Camp. The accommodation here is in a brick under thatch chalet, each bedroom with its own private bathroom/wash-basin and toilet. Each chalet is also equipped with a fridge. This morning, more game viewing follows as we leave the Hluhluwe uMfolozi Park to board a boat for a two hour cruise on the lake in this proclaimed World Heritage Site. Here you are guaranteed to see hippos, and a very good chance of seeing crocodiles and a vast array of bird-life. The iSimangaliso Wetland Park has both one of the largest estuary systems in Africa and the continent's southernmost coral reefs. In granting it World Heritage status in 1999, the World Heritage Committee noted the park's "exceptional biodiversity, including some 521 bird species". Situated on the central Zululand coast of KwaZulu-Natal, the park is made up of 13 adjoining protected areas with a total size of 234 566 hectares. Its remarkable biodiversity is a result of the park's location between subtropical and tropical Africa, as well as its coastal setting. The iSimangaliso Wetland Park has its origins in the St Lucia Game Reserve, declared in 1895 and made up of the large lake and its islands. St Lucia Park was proclaimed in 1939, containing land around the estuary and a strip of about one kilometre around most of the lake shore. After our two-hour cruise and lunch we make our way back to Durban, arriving in the late afternoon where we overnight at the City Lodge, Umhlanga Ridge (or similar). Ideally situated next to the upmarket Gateway shopping and entertainment complex, City Lodge Umhlanga Ridge blends into the surroundings of its modern environment. The five-storey hotel is in the heart of the new business district that has emerged in the Umhlanga area and is a short drive from Umhlanga's popular promenade and beach front. This morning we have an early departure from Durban and head to the southern Drakensburg, where we transfer to our 4X4 vehicles for the ascent up the Sani Pass and into Lesotho. Breathtaking scenery and alpine conditions dominate this truly magnificent corner of this province. The Sani Pass is a spectacular mountain road that is a well-known entry point into Lesotho from South Africa's Natal Drakensberg Park. It is the gateway to the 'Roof of Africa' scenic route that links the spectacular scenery of the Drakensberg with the mountains of northern Lesotho. The Sani Pass is the only border post between Kwazulu-Natal and Lesotho. The Sani Pass was once a rough mule trail descending the Eastern Highlands of old Basutoland into Natal. Tough drovers brought wool and mohair down the Pass on donkeys and mules to be exchanged for blankets . clothing . maize meal . the essentials for life in a remote, impoverished country. And a young man had a dream . of operating a motor vehicle service up this fantastic Pass, using the 4-wheel drive vehicles he had seen on service in World War II. The Sani Pass was born. Once we have entered Lesotho we will stop off at a Basutho village where one can learn more about the life of these very friendly people, in this, one of the world's poorest countries. Lunch will be at the "highest pub in Africa", the Sani Top Chalet, for your own account. We will also have some time here to walk along the edge of the escarpment for stunning views into KwaZulu Natal, before descending the pass to Moorcroft Manor. *NB. Warm clothing is a must, no matter the season of the year! You will also need valid passports for the crossing into Lesotho. The ascent of the pass is subject to the prevailing weather conditions. We will overnight at Moorcroft Manor (or similar). Moorcroft Manor offers classically decorated rooms all with bathrooms en suite. From Moorcroft Manor we travel via the Midlands Meander route to our next overnight at Montusi Mountain Lodge (or similar) near the Royal Natal National Park area overlooking The Amphitheatre. En route, there will be shopping opportunities at local art and craft venues. We will overnight at Montusi Mountain Lodge, which offers genuine hospitality in the tranquillity of one of the most beautiful settings in Southern Africa. Space, comfort and peace are what you will find when you treat yourself to the natural splendour and peaceful, romantic ambiance of this Drakensberg haven. Situated in the KwaZulu-Natal Drakensberg, halfway between Johannesburg and Durban, Montusi is the only upmarket destination in the area with a full and uninterrupted view of the Drakensberg's most famous part, the Amphitheatre Escarpment. Our guests enjoy this spectacular scenery in the comfort of their private individual garden suites. Activities here include hiking and swimming. Spend the remainder of the day relaxing or exploring this incredibly beautiful area. Today we depart Montusi Mountain Lodge and drive through to reach Johannesburg in the late afternoon to drop you off at your overnight accommodation or at the O R Tambo International Airport in time for your flight.